At the TNNA Market in Columbus, I had the chance to see the newest Halloweenies from Kelly Clark, Elvira Spida. She is quite a looker. Let's hear it for the Full Figures Girls! WhOO! 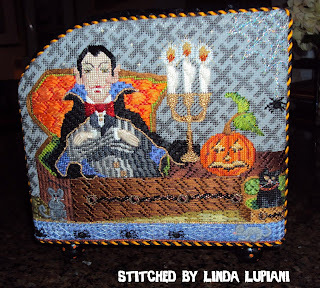 To refresh the memory of Needlepoint Study Hall Blog readers, Amy Bunger stitched 8 of the Halloweenies pieces through her Home Study. You can read all about the specific Halloweenies postings on this blog by clicking on the HALLOWEENIES topic list or by clicking on their individual names. Stitch Guide by Robin King available. I stitched Katt Z. Witch (KCN 9125) and wrote her stitch guide. 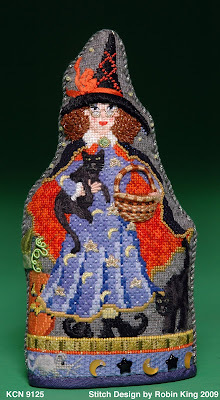 Anyone (Retail Shops or needlepoint customers) interested in purchasing the Katt Z. Witch stitch guide can email me at creativecats@comcast.net. 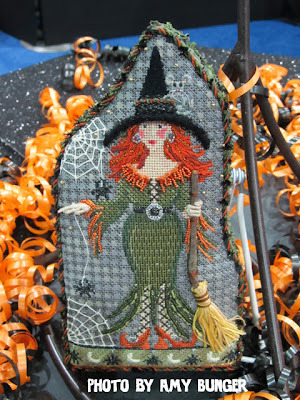 I read Melinda's Living the Good Life blog about recently sending more Halloweenies pieces to the finisher. Here's the link: http://melindaslivingthegoodlife.blogspot.com/2011/06/looking-back-and-looking-forward.html Hope to share their photos after they are all dolled up. 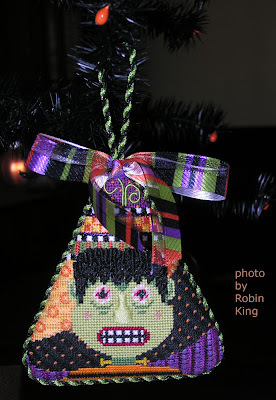 It's the 300th blog posting for Needlepoint Study Hall blog. Who knew Peggy and I had so much to talk about? 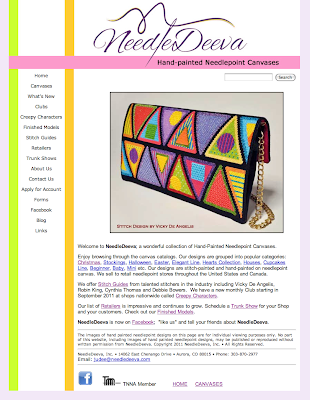 I wear many hats: designing and managing websites, writing stitch guides, teaching and photography. 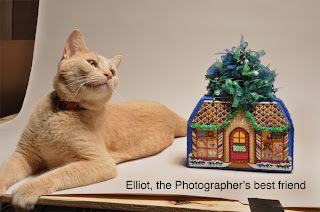 Through all of those tasks, I had a constant companion... Elliot, the Cat. 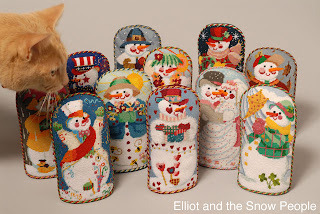 Elliot loved to be in the spot light; the center of attention. 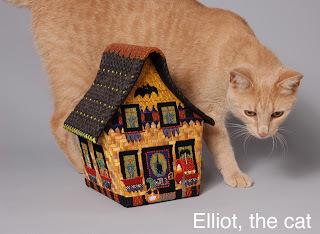 So, when there was a needlepoint canvas or needlepoint model to be photographed, Elliot was right there. He liked the lights, the camera, and the action. 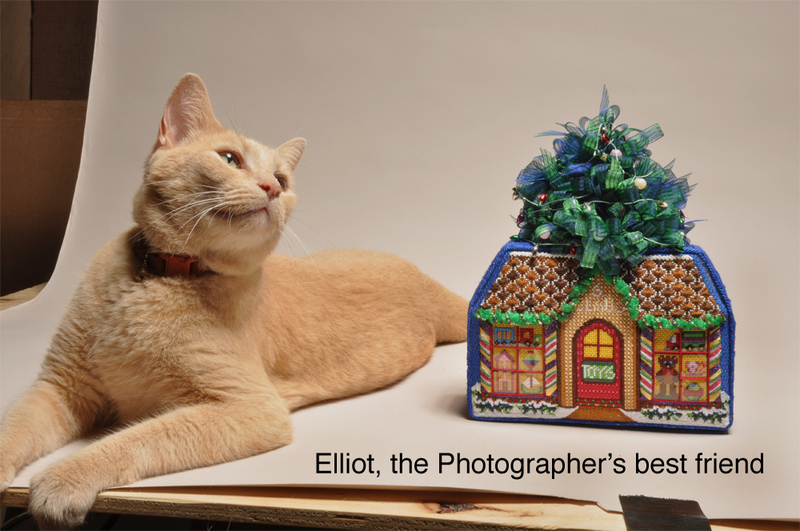 Here are some photos of Elliot's best work. Ghost is finished. Here is your first viewing of him. 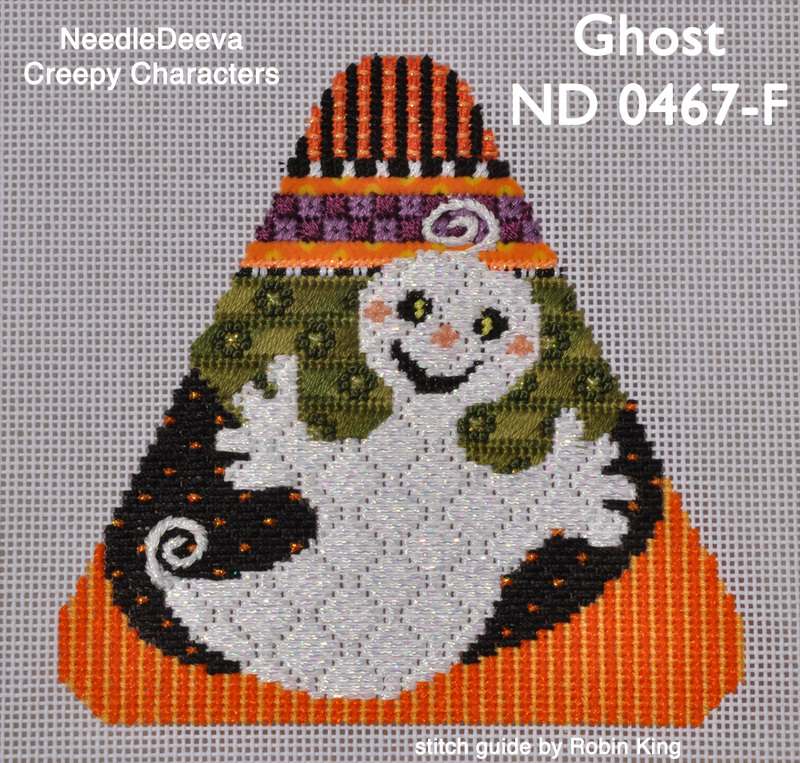 He is the 6th character from NeedleDeeva's Creepy Characters club/series (ND 0467-F). 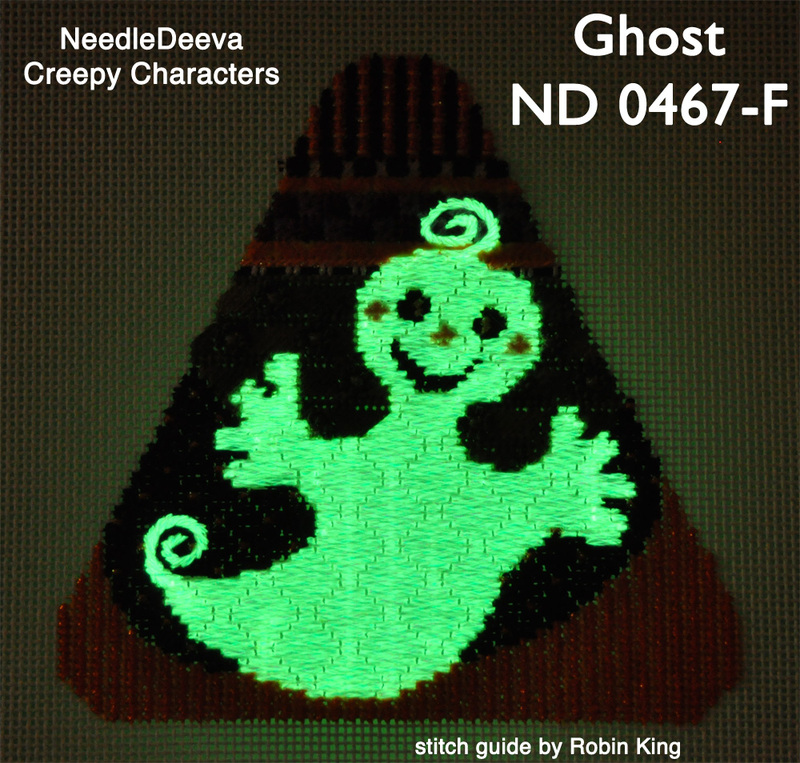 I used Glow in the Dark threads for each of the Creeps... except for The Devil. Mostly, I used the DMC Glow in the Dark E940 floss. It is a nice thread to use because it is stranded and works beautifully with the laying tool. I've used other Glow in the Dark threads in the past. After all, my passion is Halloween. 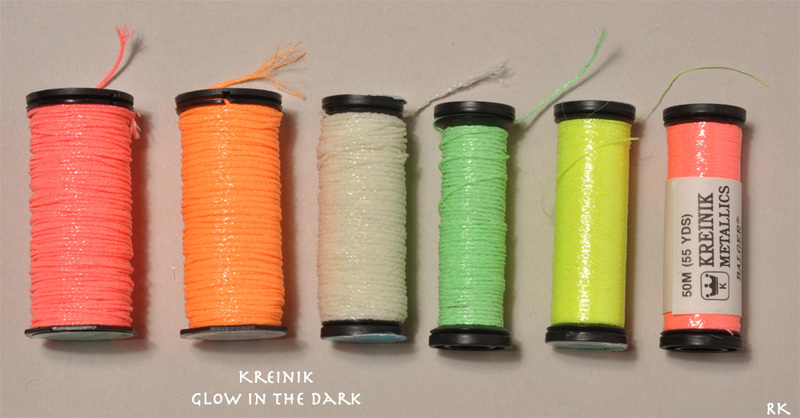 Kreinik has a nice assortment; these are from my stash. 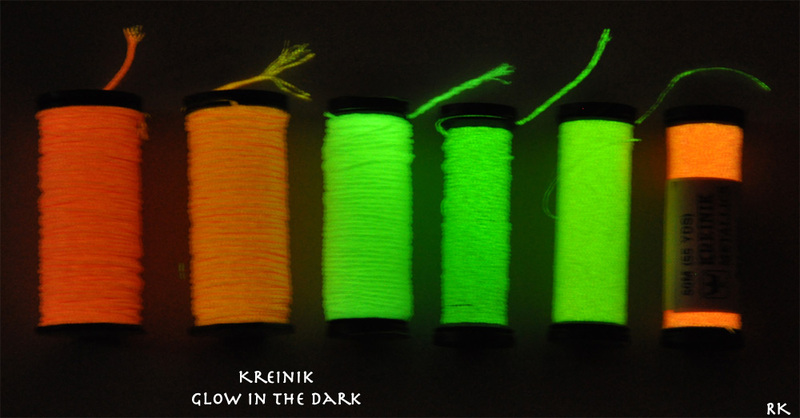 Kreinik's Glow in the Dark collection is available in sizes 4, 8, 12, 16, 32, 1/8" ribbon, 1/16" ribbon and Blending Filament. Sweet! 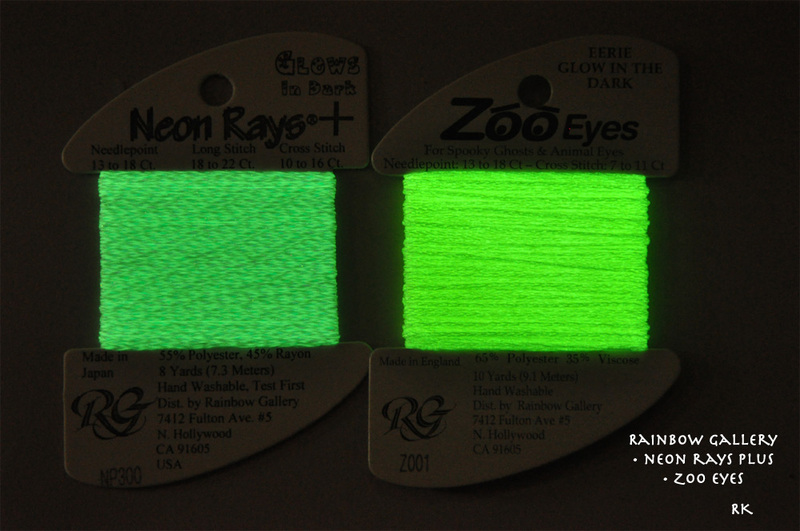 Rainbow Gallery introduced their Neon Rays Plus Glow in the Dark NP300 at the Columbus Market. 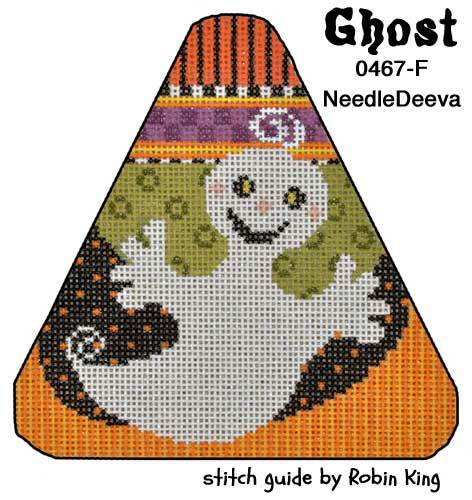 I was fortunate to stitch with it on the Ghost. YEOW! It's awesome. Works beautifully, too. 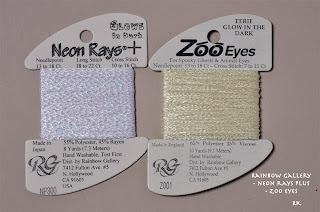 Rainbow Gallery also has another Glow in the Dark thread called Zoo Eyes (Z001) for Needlepoint: 13-18 count or Cross Stitch: 7-11 count. The things I have learned while stitching the Creepy Characters! 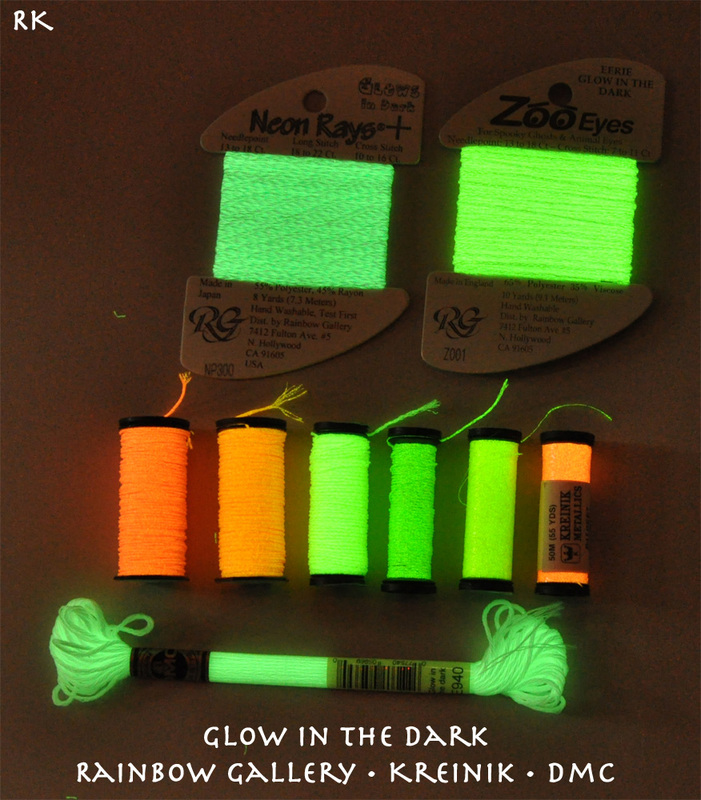 Here is a group shot of available Glow in the Dark threads. So, what do you think? Might give it a try? 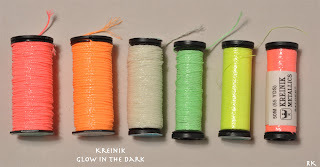 Thanks to all of the awesome thread companies. 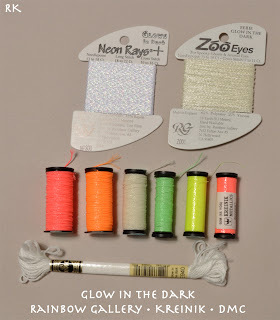 You know how to put the fun into stitching. Oh, yes... here's the Ghost, too. I've been tying up loose ends from Market and began Phase Two of Creepy Characters deadlines. All stitch guides must be written and printed by July 31st. 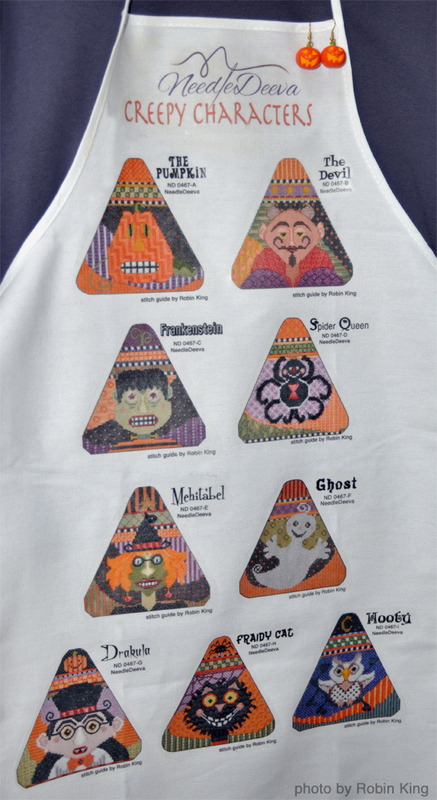 The Ghost must be stitched and sent off for finishing. Hooty Owl must leave the nest and fly to Oregon for his Needlepoint Now debut. Lots to do. Yesterday, I photographed the Creeps both individually and as a group. The group shot is quite impressive, don't you think? 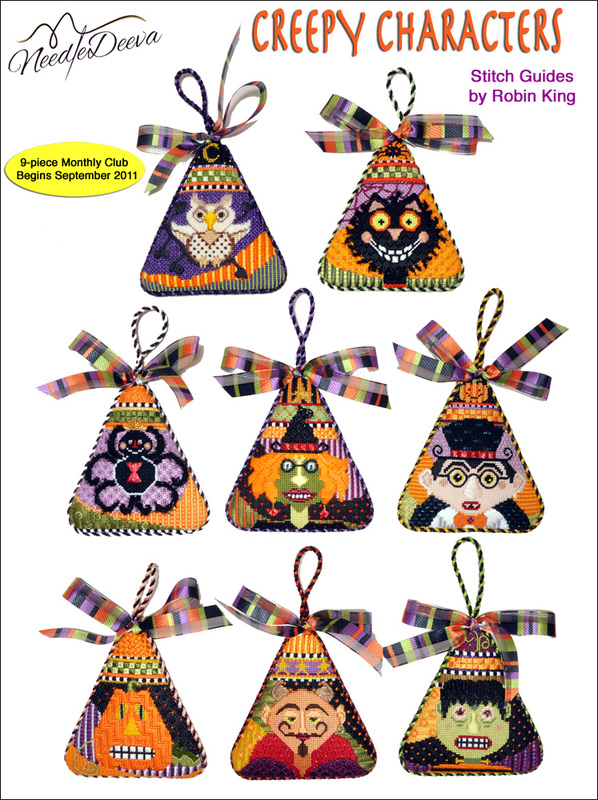 The ornaments were finished by Elizabeth Turner Collection in Lexington, KY. Boy, was I pleased. 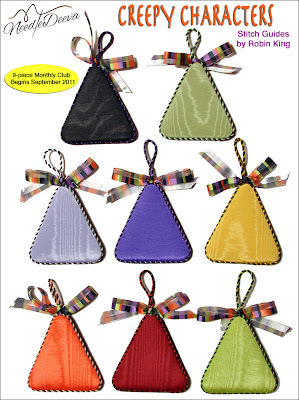 Each one has its own color of moire and twisted cord trim complimenting the piece. And, I LOVE the ribbon. ETC is the best! 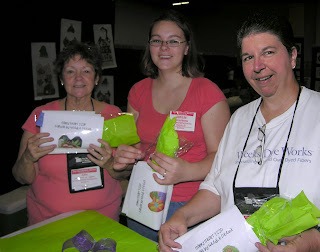 Oh, I forgot... one more deadline: teaching Fraidy Cat at the TNNA Fall Market in Baltimore, August 12, 2011. For those shop owners attending, come take the class (FT201). It will be a fun time, indeed. Hi Everybody... Robin here... back in Memphis. Market was a wonderful experience. I treasure the opportunity to travel with Amy and Jill. On the drive home from Columbus to Memphis, I decided to stitch on the canvas from the Associated Talents' class I took on Sunday. "Let it SNOW" is one of the Associated Talents seasonal message canvases. I know you have seen some of their other ones: Be Mine, Happy Halloween, Happy Easter... 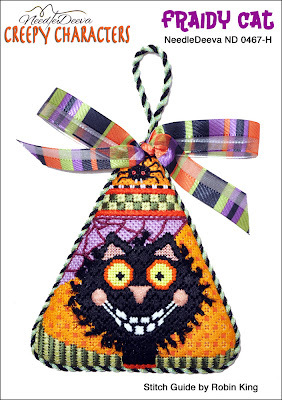 It is on 13 mesh and measures 8.5"W x 4.5"H. It comes with their stitch guide; Don's ideas are cuter than cute. 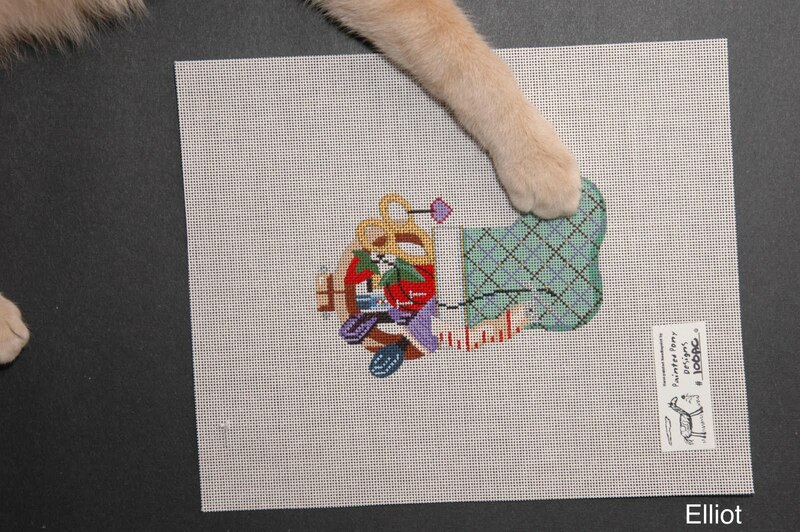 In class, I began stitching the background. 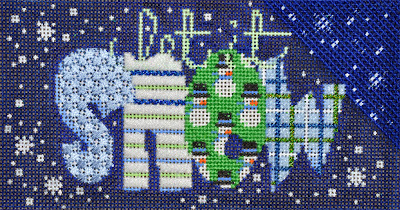 Carol and Sandy taught an awesome technique for twisting & couching the DMC Memory Thread spelling out the "let it." 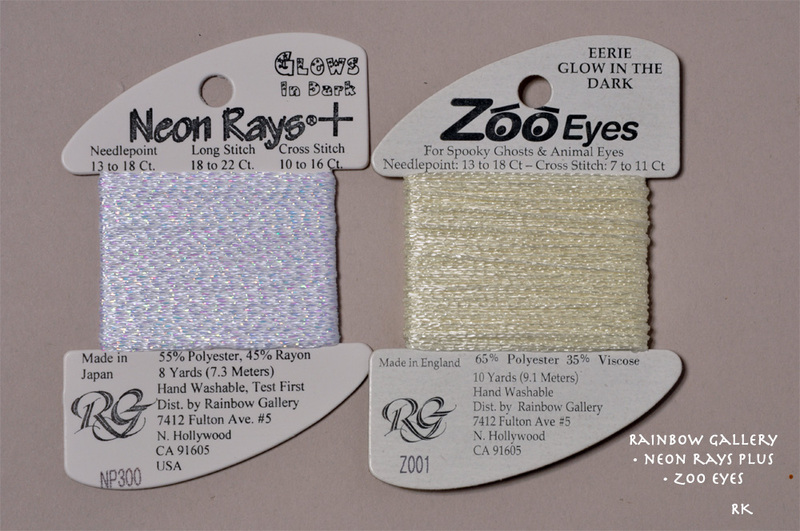 Later that evening, I cut my lengths of Neon Rays and straightened them with my flat iron. From Cincinnati to Louisville, I stitched on the N.
From Louisville to Nashville, I stitched on the O. From Nashville to Memphis, I stitched on the W.
A 9-hour car ride was enjoyable and productive. Amy was productive, too. She stitched on both the H and the A of her upcoming THANKSGIVING banner for her Home Study. Now, I am back home. Time to put SNOW down and pick up the Ghost. He is the last piece to stitch of the NeedleDeeva Creepy Characters series. I took the finished models to the Rainbow Gallery booth to show Sally. 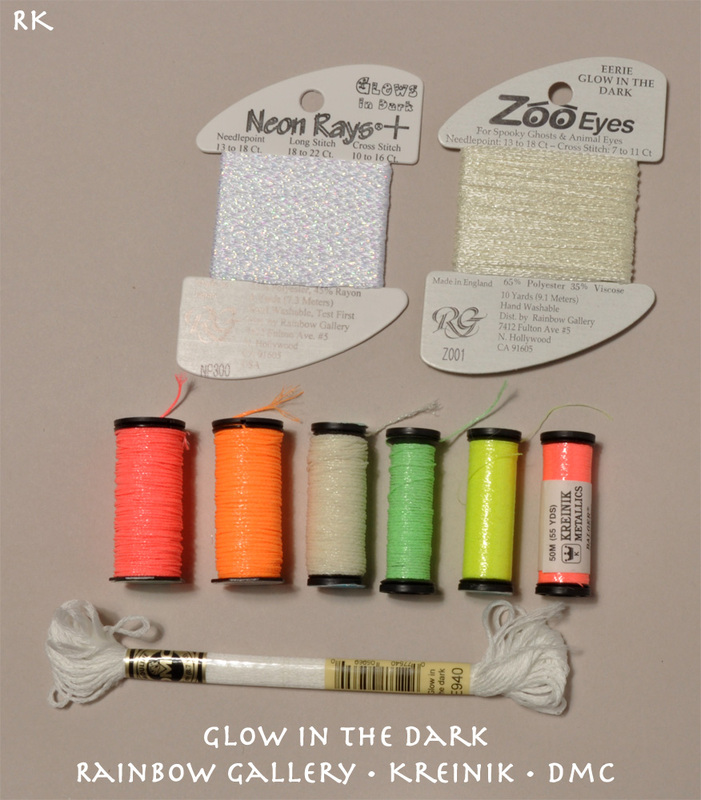 I asked her if Rainbow Gallery had any "glow in the dark" threads? 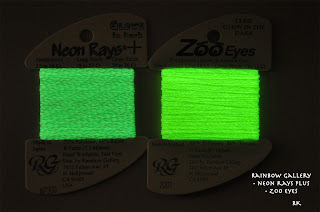 I was thinking about making the Ghost special but the inspiration hadn't appeared... until Sally said, "Yes, we have the NEW Neon Rays Plus Glow in the Dark thread." OMG. Can you believe that? I can't wait to use it. Hi Everybody... Robin here... in Columbus... Day 3. Today was another fun day in the Deeva booth. More and more shop owners had thought about the Creepy Characters over night, and turned in their paperwork today to join the Club. 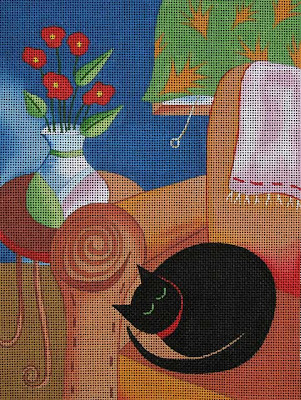 Looks like the Deeva will be increasing the size of the upcoming Needlepoint Now magazine ad in order to list all of the participating Retailers. I did sneak away to photograph some things with Amy and Jill. In the Maggie Co. booth, there was a new cat canvas which caught our attention. Love that comfy cat on the chair. But wait... have we seen it before? Maggie said it was a new designer; not the same designer as the one I had stitched. Very interesting, don't you think? I'm having a déjà vu moment... how about you? Sundance had the Lampwork Bead cat heads with painted canvas cat bodies. Too cute. Clever idea. I know not all people are cat lovers so thank you for allowing me to do so. It's been 3 days since I've hugged a cat. Hi Everybody... Robin here... in Columbus... Day 2. Oooweee! WHAT a day! My dogs are barking! 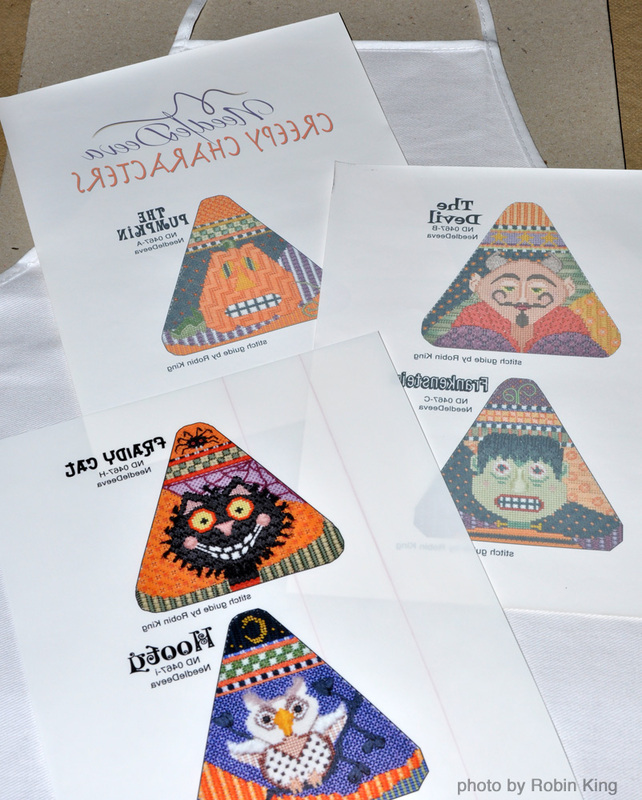 I was in the NeedleDeeva booth all day today. The time passed so quickly. People came in... two by two, even... with interest about the Creepy Characters. Many Needlepoint Stores are signing up. The Deeva is thrilled. Today's show closed at 6PM. Tonight's rested evening was wonderful. We ordered a pizza and had Buckeye Crunch for dessert. Buckeye Crunch? Have you heard about it? 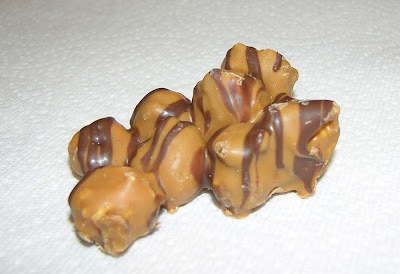 It's Peanut Butter & Chocolate Carmel Corn... OMG! I never knew that was possible. Jill and Amy stumbled upon it at the Krema Nut Company. They bought it, and we devoured it. A Columbus memory has been made. Hi Everybody... Robin here... in COLUMBUS! Yes, Columbus, OHIO, at the TNNA Summer Market. Today I had the wonderful opportunity of helping NeedleDeeva set up their booth. Mainly, I stayed out of their way... but, I did get to help assemble their Sample It items: the new 3 Heart canvases plus Vicky De Angelis stitch guides in a cellophane bag with lime green tissue and purple ribbon. They were very popular; in fact, NeedleDeeva sold out. Way to go TEAM Deeva. Sample It went from 5-6PM. The Needlepoint Showcase took place from 5-7PM. It was the Creepy Characters first debut. Elizabeth Turner Collection did the finishing. OMG... they exceeded my expectations... the Creeps look WONDERFUL. 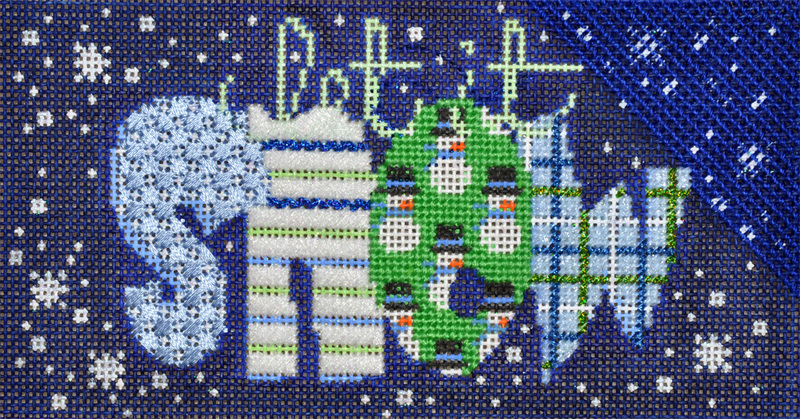 I highly recommend ETC for needlepoint finishing. The Creepy Characters were placed on the Black Halloween Tree. Other small Halloween ornaments were added to fill out the tree. IMHO it was a show stopper! The signage board had eye-catching LED Blinking/Twinkling stars. There were compliments on my Apron, too. I enjoyed talking to the interested Needlepoint Shop owners. I knew many of them from my previous TNNA teachings. They listened to my spiel but actually the finished models told the story. It was a good day in deed. But, WAIT... there's MORE. 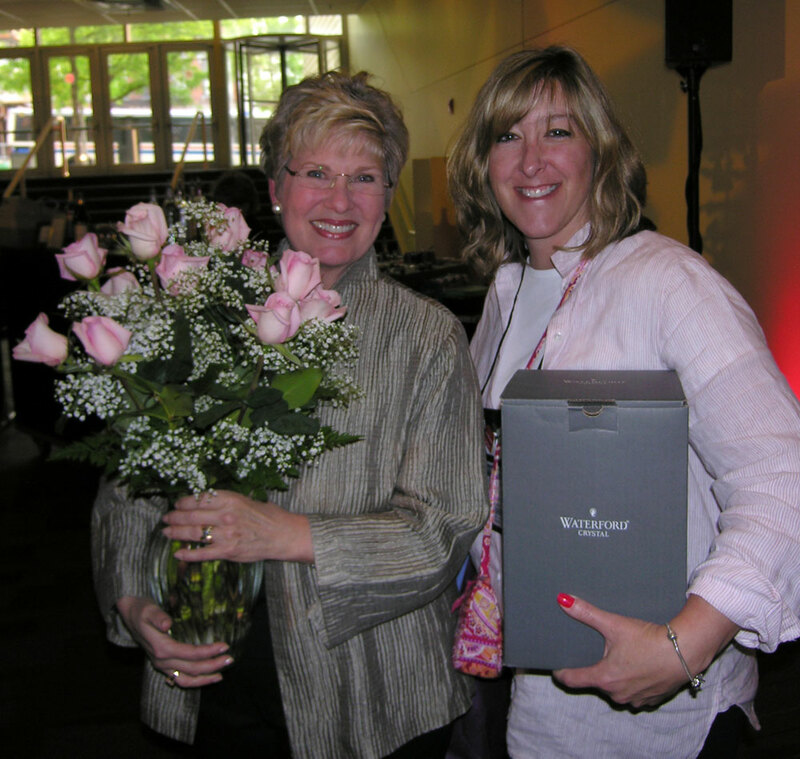 Amy Bunger was awarded TNNA's prestigious TEN Award; (Tribute to Excellence in Needlearts.) We were very proud of Amy. I know she will have more to say about that moment in her July e-newsletter. Jules, a very pretty Calico cat. Jules is our cat. She is Elliot's sister. 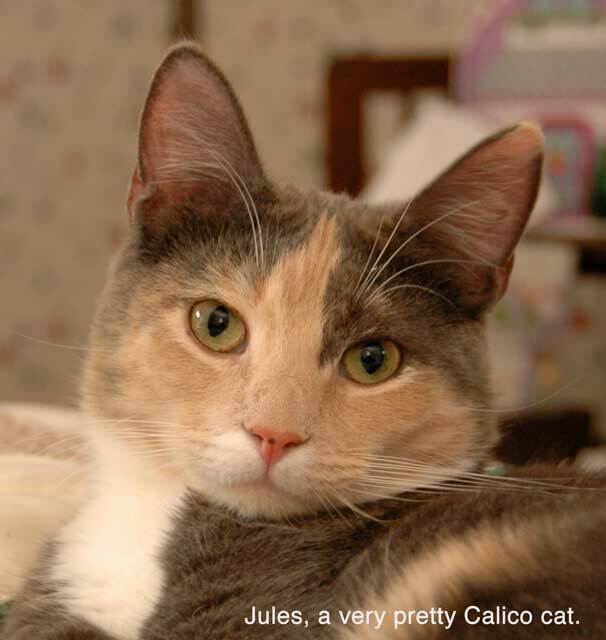 Jules is a very pretty Calico cat. 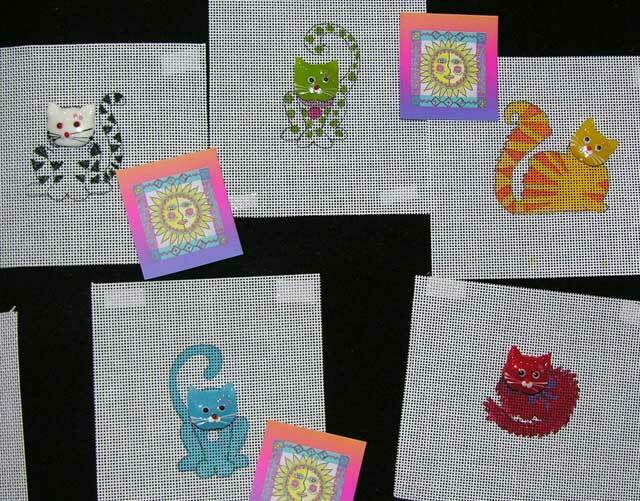 A. Bradley Needle Arts, Inc is introducing a new Cat Mini-Stockings line of canvases in addition to her new Dog Mini-Stockings at Columbus/TNNA. 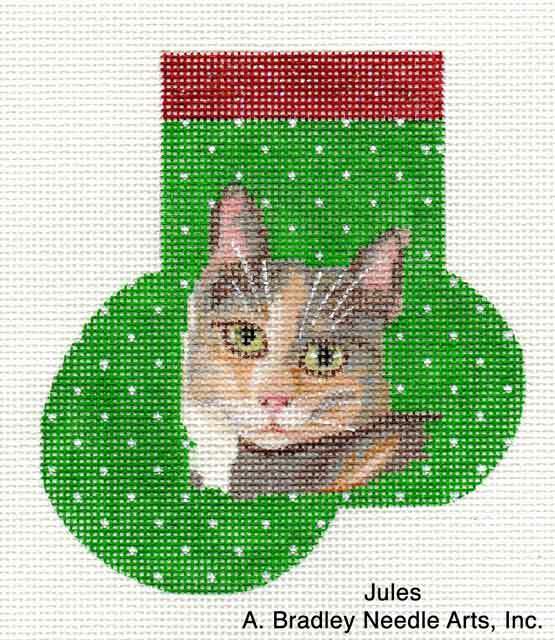 A few weeks ago, I sent Ashley a photo of Jules... just in case she would consider including a Calico cat in the new designs. Ashley admired Jules and painted her likeness to represent the Calicos. How fun is that. 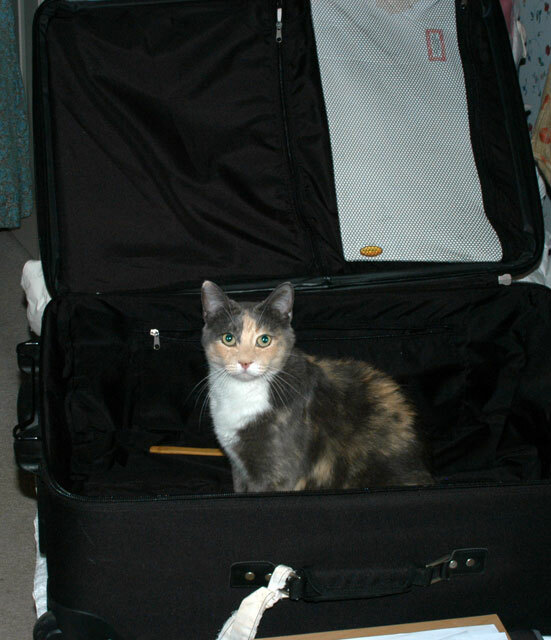 I am almost ready to go to Columbus. Next on my list is to pack the suitcase and the needlepoint. 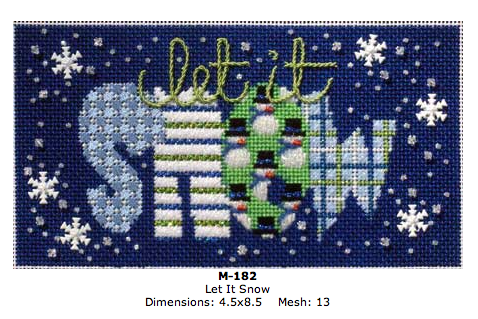 After all, it is a Needlepoint convention, right? But first, I wanted to show you what I made yesterday. I made a Creepy Characters apron! I am going to wear it when I stand with my NeedleDeeva Creepy Characters display during the Needlepoint Showcase on Friday evening. It's all about getting noticed... getting one's attention. 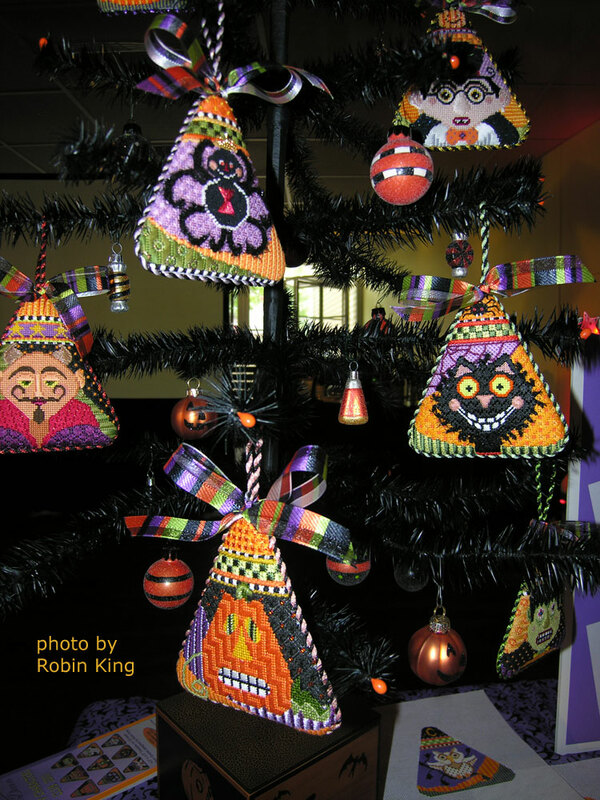 Hopefully, the display (decorated Halloween tree), the signage and the Apron will get Needlepoint Shop owners' interest to sign up for the Creepy Characters Club. 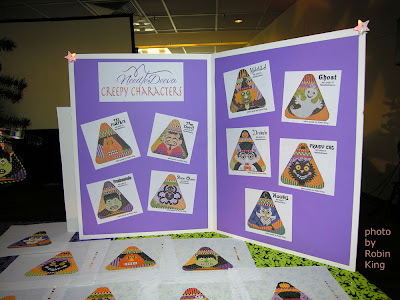 I used the same graphics I created for the Creepy Characters Stitch Guides cover sheets, and printed the design onto the iron-on transfer paper. Be sure to Flip Horizontal or else your design will be backwards. I wanted to share some fun news with you. 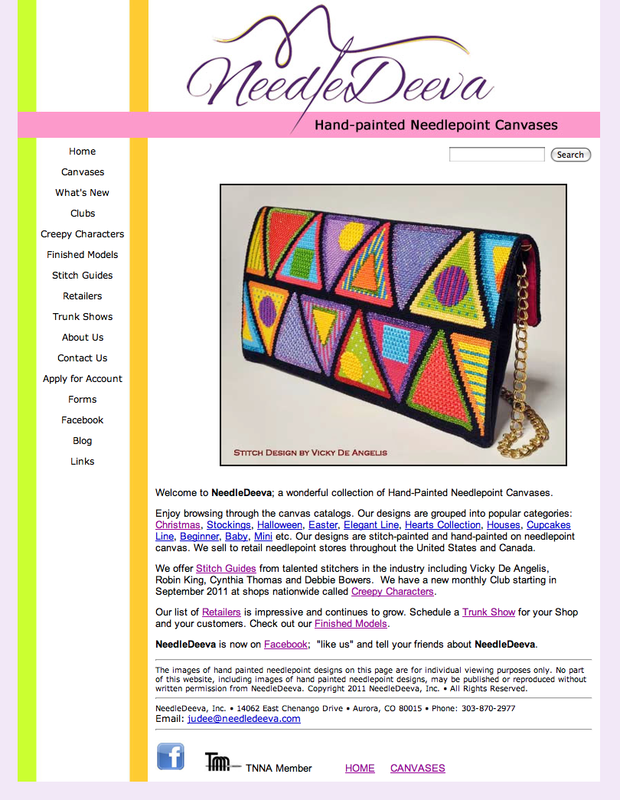 BeStitched Needlepoint is now open. The owners are Jeannine and Lisa, and they are located in Scottsdale, Arizona. 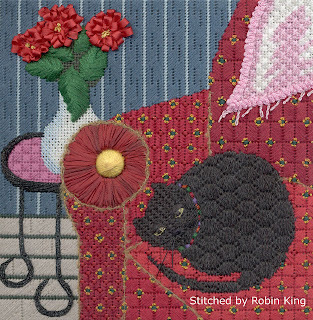 I have met both ladies; our friendships began on Stitcherie.ning.com. I just called them to with them Best of Luck, and ordered a canvas for Wendy Harwood to design a Stitch Guide. How awesome is that! I will blog about it for sure. Their website is http://bestitchedneedlepoint.com/ and their phone number is (480) 991-0706. 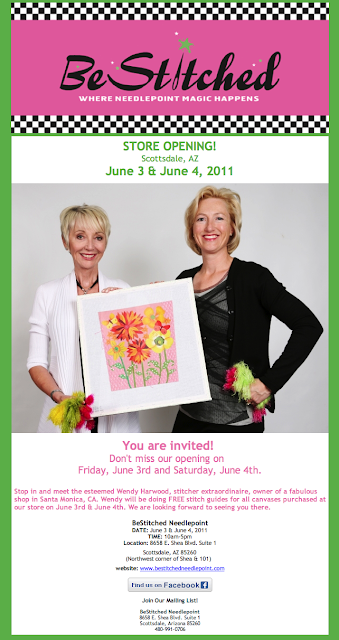 It is nice to have another Needlepoint Store in our community. 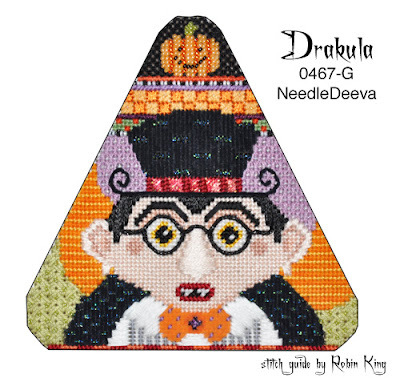 Drakula from NeedleDeeva is finished! I met all deadlines last night. Finished Drakula at 8PM. Generated the FedEx air bill, typed the instructions letter to M's Canvashouse, and said "bon voyage" to my newest Creepy Character from NeedleDeeva. He arrives in Lexington today and begins his transformation into an ornament. He is so cute; I really fell for him. I had the best time designing his Halloween Couture cape and top hat. The bow tie really completes the ensemble. His eyes glow in the dark as well as those fangs. His eyeglasses are Kreinik Hot Wire, and again, I used the lasso technique. My last deadline was outputting Amy's e-newsletter June 2011. Got it done and it is now online. I slept good last night. Hmmm... I wonder why? Ghost (ND 0467-F). Right now, I am calling him Mr. Jazz Hands. LOL. He will be my traveling companion to the Columbus TNNA Market. 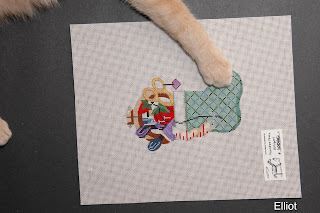 I will stitch him in the car while Jill drives; Amy will be stitching her Thanksgiving Banner, too. What a scene that will be! Today's list of things to do begins with tidying up all of the Creepy Characters threads. (Looks like a minor explosion happened as the deadlines were approaching!) 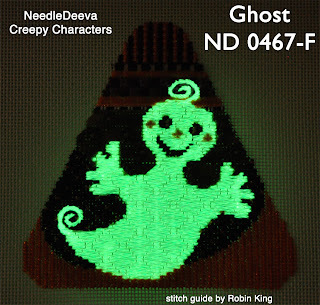 Then, it's time to begin writing the Creepy Characters stitch guides. 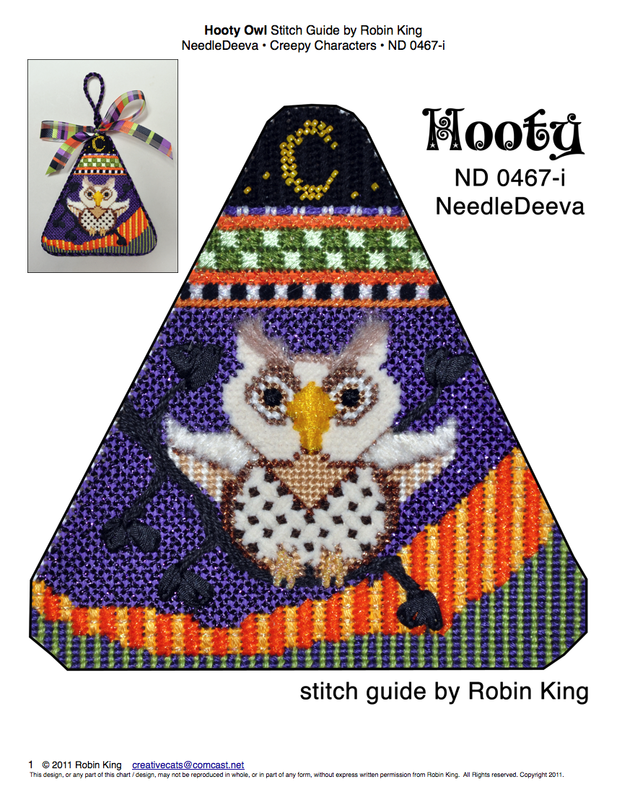 First will be Hooty because his information needs to be sent to Needlepoint Now. 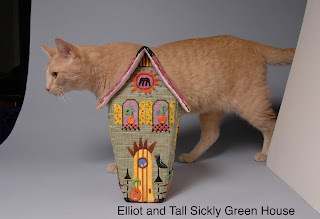 Second will be Fraidy Cat because I will be teaching his class at the TNNA Fall Market in Baltimore, MD in August 2011. The rest of the Characters will be done in alphabetical order.